Embrace your love of music with the best Bluetooth speakers in the market. With the help of wireless technology, you can use these best-quality speakers anywhere you like. These Bluetooth speakers can lighten up every party, you can carry these personal music stations to your family picnic or beach party and groove those killer-moves on the beat of powerful base traps. 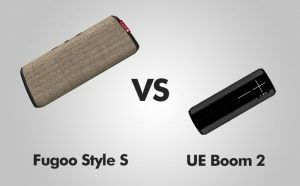 Here is a comparison between two of the most popular Bluetooth speakers on the market: Ultimate Ears Boom 2 and Fugoo style S.
178 x 64 x 64 mm 2.5" x 8.3" x 2.9"
Ultimate Ears Boom 2 is the classy Bluetooth speaker which comes with a 360-degree wireless reach that helps the music to reach in every direction. The 3600 design offers an insanely good loud and deep bass. This wireless speaker is a fine piece of work made with high-quality material that helps it to last long even in rough conditions. Apart from its toughness, the best part of its design is that it can easily fit in a pouch or a handbag so that you can carry your music buddy with you everywhere. As this speaker conveys a wireless approach, you can just charge it with the convenient charging slot that it offers and use it on the go. With a top-notch lithium-ion battery, this device packs a powerful 15 hours of battery backup when fully charged. The design of Fugoo Style S is something that makes it much more popular than its competitor wireless speakers. It has a pretty classy look and goes with everything from your coffee table to beach to Kayak. As it has an IP67 rating, you can use it in water or dusty conditions without any worries. The material used to make the body of this device is a mixture of polycarbonate and glass fiber which gives this device durability. It is shockproof and can withstand a drop from 6 feet. It has a full house in terms of its sound performance, as due to its shape and structure you will get the music flowing in every corner of your hall. With an immensely powerful bass hat this device packs within itself, there is no denying that anyone would not fall in love with its sound quality as it produces great quality of sound with smoother mids, silkier treble, and deeper bass. When it comes to devices’ compatibility with the environment in terms of sound quality, Ultimate ears’ Boom 2 gains the advantage as it provides you the 360 sound that is quite neat & crispy even in the high and mid frequency. Ultimate Ears BOOM2’s loud sound production is its key of attraction. It is one notch above most of the same range speaker devices when it comes to those bass-heavy songs. Assuming you are not hosting an actual dance party, it would be very surprising if this Bluetooth enabled device runs out of the volume. Fugoo style S delivers a crisp and loud sound but despite this, it is not as loud as other wireless speakers of the same range. It has a good tonal balance & delivers sound much better, and if you pay much attention, you will be able to hear sibilance and snares. Apart from these, it can be paired along with other Fugoo speakers to create better sound and also as the company is providing regular firmware updates you should expect better sound in the upcoming days. This wireless music device delivers high-quality sound and powerful bass besides these features, Ultimate Ears Boom 2 is a winner when it comes to design as it has a 360-degree reach which not only gives it the freedom to be placed anywhere and not just stuck to wall side but also you do not have to flaunt this powerhouse as its classy look speak for itself. Lithium-ion batteries with 15 hrs of battery backup have you completely prepared for long trips and with its light weight of just 1.2 lbs, making it easy to carry as you can just slip it in your coat or handbag. It is highly durable and comes with a guarantee of shock proofing and water resistant. It can pair with almost every Bluetooth enabled device and offers a ‘Tap the speaker’ feature with which you can control it with options of play, pause and skip. This small package is filled with some really nice features. Fugoo Style S is compatible with almost any device of any platform such as Windows, Galaxy Phones, Android, iPhones etc. this Bluetooth device offers much more than a User needs as it is compatible with Google Now and SIRI. With its long-lasting built-in Lithium-ion Battery which is rechargeable via power cables, you can play your favorite music without any worries as once fully charged it stores enough juice to blast for almost 15 hrs when played on 50% sound. It has a voice-enabled speakerphone making your phone calls easier. PROS: 360 sound reach / deep bass. PROS: High durability / long-lasting battery / Music Assistant enabled. CONS: No compatibility with AI assistants / losses juice faster when played on high volume. CONS: Sound lacking power. To choose between these two Bluetooth speakers you have to judge them according to your needs but for a universal usage, Fugoo Style S is a much better option than Ultimate Ears BOOM 2. Boom 2 is without a doubt the loudest and better sound producer but in terms of battery backup, it lost by a long shot. Fugoo Style S comes with many more features than BOOM 2 and is practically a better choice for anyone who does not strive for a really loud sound and prefers durability and battery backup.